The realisation of being in a fire fight and running out of ammo and trying to either reload a magazine in the field or fumbling around whatever pocket a magazine maybe stowed in soon shows up the need for a load carrying ability. After a few skirmishes you soon get tired of the previous scenario, so I soon found that one absolute essential for Airsofting was the ability to carry spare magazines into the field, along with BB’s and anything else which might take your fancy (spare battery for the AEG, torch, etc the list could be endless if you like everything but the kitchen sink). Being on a tight budget, having blown most of the cash on my first AEG plus magazines and batteries, I opted for the cheapest ‘vest’ I could find and this came in the form of the Viper LA Special Forces Vest (Bulle also do one very similar in style). I was able to obtain mine from Military Mart (their shop is located in Aintree, Liverpool) for the very reasonable cost of £25. I got mine in Olive Green but they are available in Black and DPM (I think they may have a new Digital DPM colour but I have not seen it yet for sale). Made from 600 denier Cordura it seems (no pun intended!) well stitched and looks like it will hold together well. The sides are laced together and the whole vest is a one size fits all solution; so if you are larger framed you may need to replace the lacing to allow for adjustments (this is easily done with some Para cord and a lighter to seal up the ends). 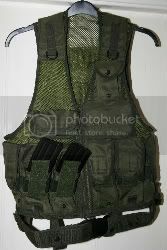 The vest comes with 6 adjustable pouches (3 each side) plus 3 utility pouches and loops for shotgun cartridges. The D-rings at the shoulder adjustment points are nice touches for those one point slings or for other attachments. Once adjusted to me the vest was comfortable to wear and manoeuvre around in. I found that I didn’t feel restricted and the addition of the belt helped keep the vest in place. However the zipped front did have a tendency to come undone in some situations which is probably my only gripe about this vest (it is missing in my opinion a clip/buckle attachment at the top which would have helped prevent this issue). 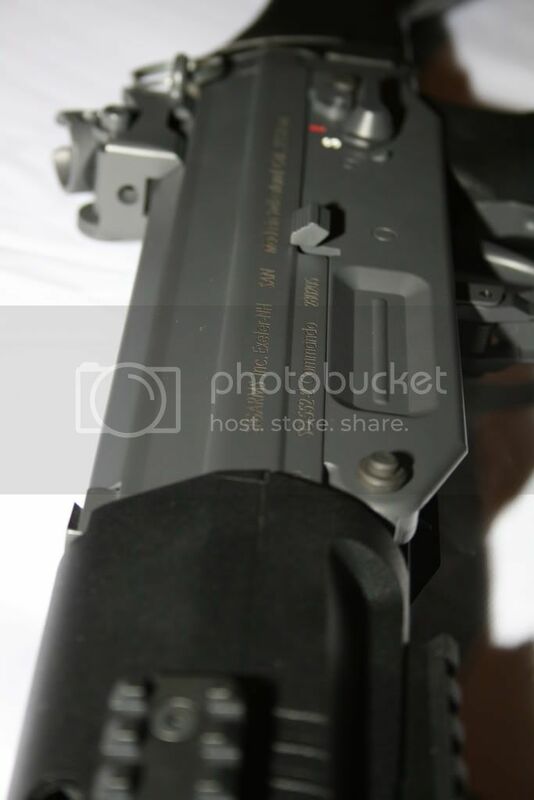 The magazine pouches easily held single hi-cap M4/M16 magazines as well as SiG552 mags (but not clipped together). I’m told that people can get MP5 and AK47 mags as well in them but I have not tried this myself. The radio pouch on the left shoulder is rather small so you may wish to check out any radio comms gear first before buying this vest. The small utility pouch on the right side of the vest has a Velcro front and when the flap is tucked in you can attach a name/team patch etc or the included looped shotgun cartridge holder. The LHS large utility pouch can accommodate easily BB’s or numerous other accessories. 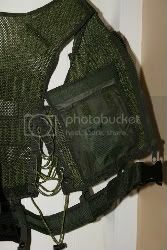 The vest also has two internal pockets for map storage etc – these are useful, however fiddly to get to during a skirmish as you will need to undo the zip to get at them (maybe keep less used items here). 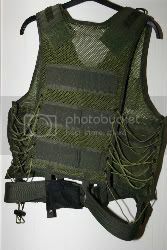 This vest comes with a belt which can accommodate if required a pistol holster (available separately from Viper) and is adjustable for the larger framed operator via a Velcro backed system which works well and is also used by the vest loops which hold the belt in place with limited slippage. 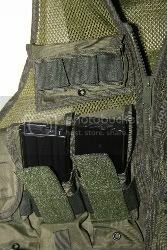 The buckle is plastic and has a button release mechanism which prevents accidental opening and is sturdy enough in normal operation..
Molle/Alice type loops are included on the back of this vest for additional attachments, but as I have not added anything here I can’t comment on at this moment. Conclusion: A great first time vest for those just starting out but the more experienced/demanding player will notice its short comings quickly. Still, a must for the kit bag for the price and on this it scores highly in Value For Money. Cheap as chips compared to some tactical vests currently available. A great vest for anyone just starting out in the airsofting world. Probably you'll need much more 'specialised' kit as you go on. But this scores highly for price and is only let down by the poor zip coming undone. [7 stars] out of 10 RECOMMENDED if your just starting out. 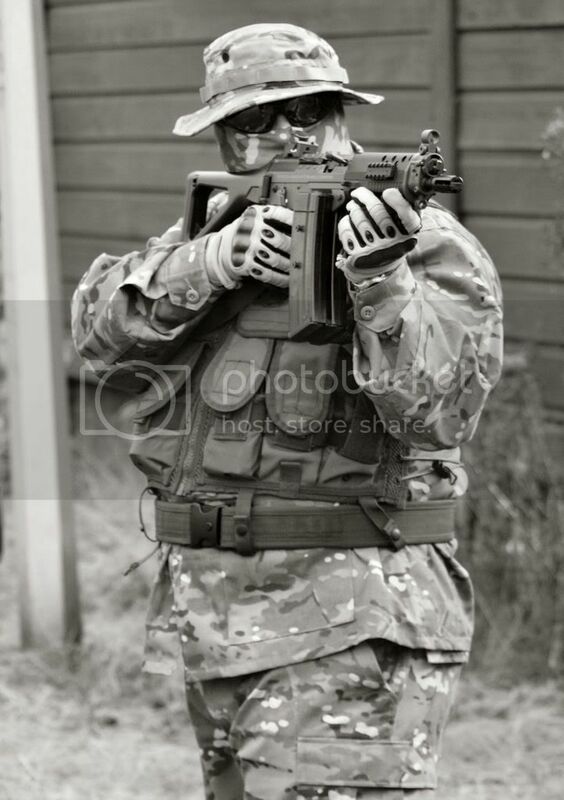 This review is copyright 2009 by Yosser's Airsoft Odyssey © and may not be be copied or reproduced without permission. Pictures are copyright of EllieTDog Studios ©. You may link to this page. Thanks I'm getting this in DPM and I'm really new to airsofting so this should be good. I have a shotgun so I can put the utility pouch to good use and I am getting a sportline Classic Army M4 soon, + extra mags. Hopefully I can attach my Viper Large Utility Pouch to the back but those straps aren't proper MOLLE so I don't want it to fall off.